All good news so far and we will keep you updated. 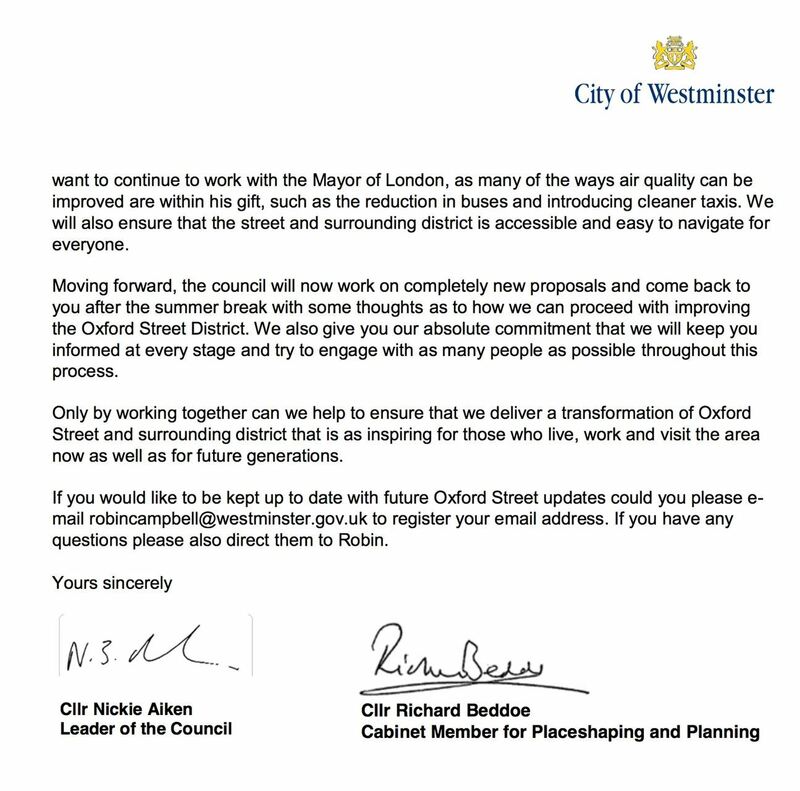 The next key date is the meeting of the Westminster Council Cabinet on 25th October where the decision on the draft Place Strategy and Delivery Plan for Oxford Street will be formally set out and sanctioned. By the beginning of 2018 Mayor Sadiq Khan appeared to have everything in place for his scheme to pedestrianise Oxford Street. It was widely believed that the recently closed 2nd consultation was little more than a necessary formality needed prior to full implementation of the “transformation of Oxford Street” i.e. pedestrianisation by December 2018. However the first sign that things were not quite going to plan was probably the unexpected extension of the original projected 6 week consultation by 2 weeks to accommodate the unprecedented level of responses. The pedestrianisation time frame was already very tight and this was not helpful. It then became apparent from the responses received that this would be no walk in the park: “it was clear that the overwhelming majority of Westminster’s residents and businesses were opposed to the concept” (Cllr Astaire, former Cabinet Member Planning and Public Realm). Headline figures showing a majority of those in favour could only be gleaned from pulling in national responses, mainly populated by pedestrianisation pressure groups from all over England, Wales and Scotland. Scratch the surface and it was clear that the local figures told a very different story. Things got a great deal worse when a number of serious errors were discovered with the consultation itself, including the use of an incorrect email address on the consultation response form. Emails sent to this address had not even been counted and could not be recovered. TfL had therefore lost an unknown quantity of responses and were unable to recover them. The consultation was reopened for a 3 week period to try and retrieve the situation, in truth, a pointless task. Relatively few knew it had been opened again and fewer still were able to recall the email address they had used for their response. A decision on the implementation of pedestrianisation that should have been made before the local elections now had to be delayed until after them. The fact that TfL were not even able to properly manage the consultation started to raise questions: if they couldn’t run this, how would they be expected to organise without mishap the most complex road closure programme ever proposed for Central London? With a West End economy where billions of pounds are at stake, this was worrying. This was not the sort of thing to get wrong. Additionally, the consultation had posed a number of other awkward questions: Where, exactly, was all the Oxford Street traffic to go? The TfL traffic modelling showed that it would largely disappear, with everything running virtually the same as before the road was closed. But how would that be possible? And did not their modelling show the same on Bayswater Road before the cycle lanes went in? But is not that area now plagued by queues and rat running? This was not a comforting precedent and gave little reassurance as to the accuracy of TfL traffic modelling. Further, major access issues emerged. How would everyone get to and through Oxford Street without any buses? How would the less athletic even manage or want to get up and down such a long length of pedestrianised road? To these questions, and many more, no satisfactory answers were forthcoming. Then Westminster Council announced it had been the Mayors/TfL’s scheme all along, there was no joint plan, they produced “Eight Pledges” designed to make the scheme acceptable but which, if honoured, would seem to make proposals to close the road impossible. Following this the Westminster Council Cabinet member in charge of the project and previous advocate of the scheme stood down, for unrelated reasons. The impending local election put everything up a gear, dramatically confirming the unpopularity of the whole scheme and introducing further evidence to show that, not only did the proposals have little support throughout the West End, but that they were unwanted by the large majority of both residents and businesses. Finally, enough was enough, Westminster Council announced that not only was there no joint plan, there was, in fact, no plan. It was announced that all work on the scheme had been stopped and that any future scheme, if there was ever to be one, need not involve pedestrianisation and would need to be developed to the satisfaction of the residents. This, rather like having to design a scheme for fox-hunting which would be acceptable to the fox, appeared to be an impossible requirement — Westminster Council and everyone else went into the May elections on the understanding that the scheme was indeed sunk. Everyone, that is, save the Mayor who appeared blissfully unaware of the unfolding debacle and had said nothing to indicate otherwise. Meanwhile the Deputy Mayor for Transport ploughed bravely on, attending various conferences still preaching the gospel of transformation (i.e.pedestrianisation), seemingly in denial of any change of plan, never mind its total disappearance. A few weeks later she also stood down, in order to “spend more time with my husband and family”. The Mayor clearly needed to be reminded that something had changed and he finally was when the Council confirmed that they “had taken pedestrianisation off the books for good” whilst expressing a desire to continue to work with the Mayor. This appeared to come like a bolt from the blue to Sadiq Khan who had obviously been too preoccupied with other matters to have followed the unfolding events over the previous 6 months. It cannot be said that the scuppering of his flagship project through the very strong democratic mandate displayed in the recent election and consultations was received with good grace. 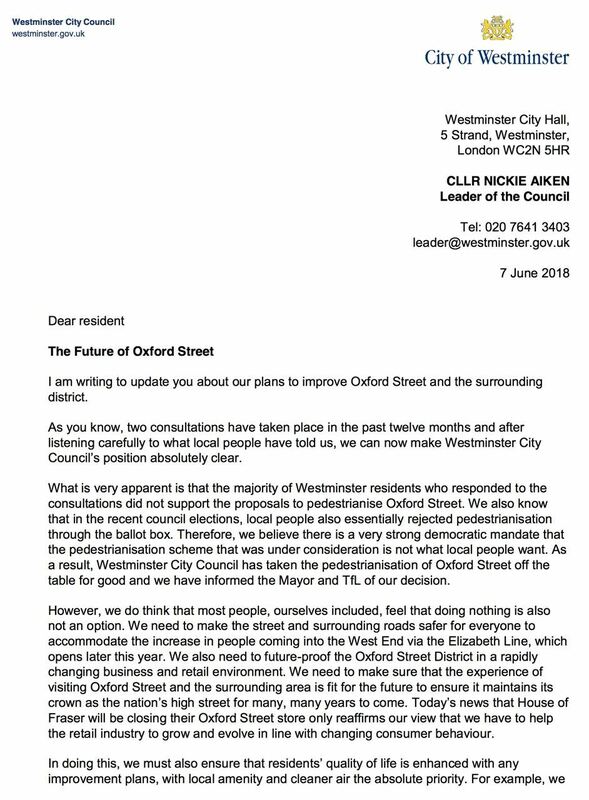 The Mayor’s response was that this was a “betrayal” and he would not be “walking away” from Oxford Street- and indeed he would not now have to do so, as he will still be able to take a bus. Whether the Mayor, after a period of reflection, decides to read some of the many consultation responses and acquaint himself with the vast number of reasoned objections to this ill-advised scheme, remains to be seen. Hopefully this will be the case and he can then proceed with Westminster Council and others to jointly develop new proposals that will improve Oxford Street without compromising access and damaging the surrounding areas. Oxford Street Pedestrianisation "off the table for good"
Welcome news on the Future of Oxford Street from Nickie Aiken. The Marylebone Association continues to work to improve Oxford Street through supporting Better Oxford Street. 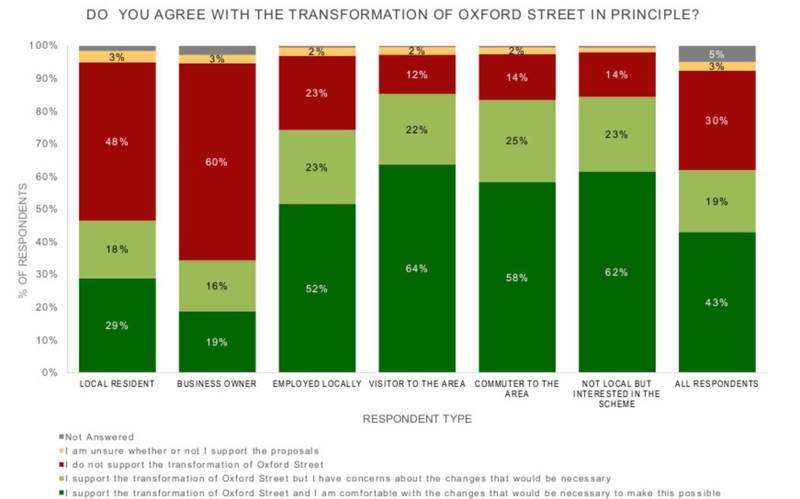 If you read the Evening Standard, the first consultation on the idea of transforming Oxford Street showed "62% of residents and businesses said they support turning Oxford Street into a car-free zone" - NOT TRUE. The first consultation sought comments on a vague concept of "transforming" Oxford Street, with no actual scheme. Hot on its heels comes a second consultation to be launched on Monday 6 November. This was intended to propose a fully thought-out design. TfL said it “was clear that any scheme must address a range of transport, accessibility and congestion concerns raised by locals and others.” We shall see! We believe this project is being rushed through with undue haste and inadequate answers to the potential impact on residential areas. Responses to the second consultation will be vital to the future of Marylebone and our neighbours. We will issue a special newsletter next week when we have seen the published consultation.